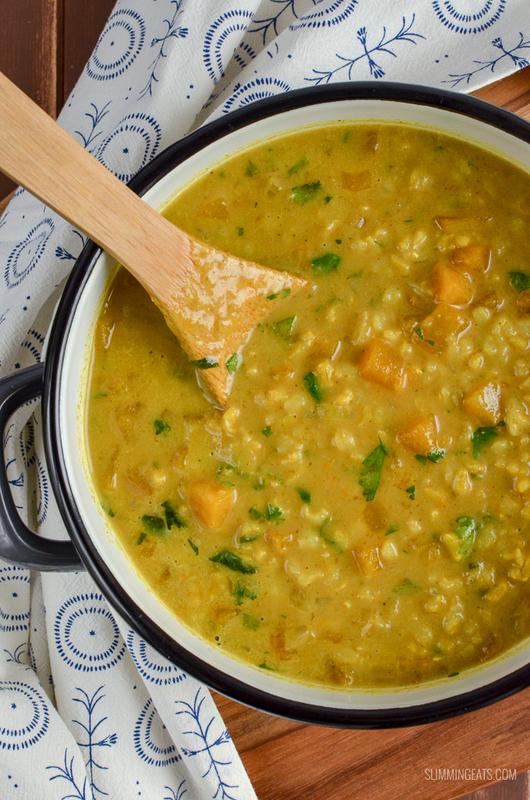 Curried Butternut Squash and Brown Rice Soup – a perfect recipe to warm yourself up on a cold winters day. This week has been pretty cold and miserable here in South Western Ontario. Snow just starting to melt, with the green grass underneath just starting to peak through. Hopefully, a sign that Spring will soon be here. Sadly though here in Canada, we often get teased with a nice ray of warm sunshine and think spring is finally upon us, when out of nowhere we have a big snowfall all over again. I have learnt not to put the winter coats and boots away because you can guarantee as soon as I do, we will have a spot of freezing cold weather again. 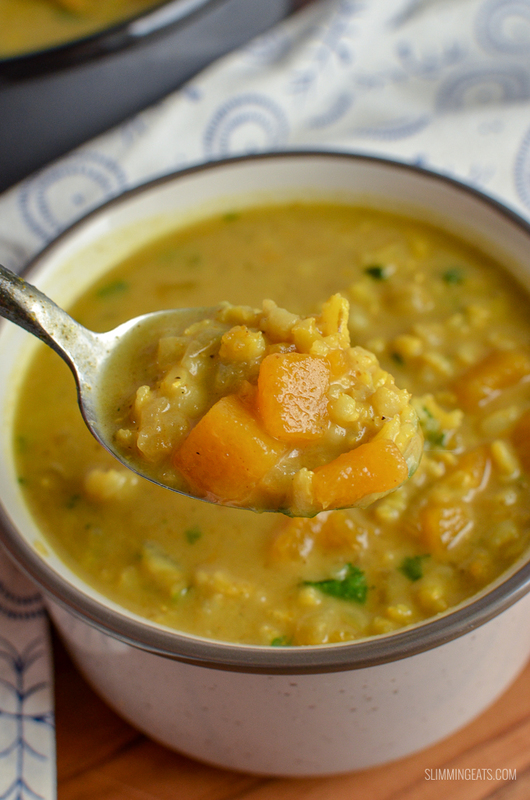 When it’s cold, I always crave a nice bowl of filling spicy soup and this Curried Butternut Squash and Brown Rice Soup definitely hit the spot. Lovely spices of curry, the sweetness of butternut squash, creaminess of coconut milk and filling high satiety brown rice. It was a complete meal in a bowl, really delicious and satisfying. No complicated ingredients, just good wholesome ingredients. I love a soup where you can just throw a few ingredients in a pot and a short while later the soup is done. 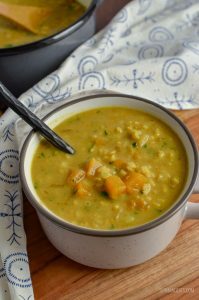 This Spicy Curried Butternut Squash and Brown Rice Soup can be cooked stovetop or in a pressure cooker like an Instant Pot. I love my Instant Pot. It is a 7in1 cooker, which slow cooks, pressure cooks, saute’s, has settings for soup, chilli, rice, porridge and even makes yoghurt (I haven’t tried that yet). or head on over to my FULL RECIPE INDEX with over 500+ delicious Slimming World Recipes. As soon as I shared the picture of this delicious Curried Butternut Squash and Brown Rice Soup on my Facebook Group, as part of my food diary, many requested it, so I knew I had to get it on the blog as soon as possible and finally here it is. Hope you all enjoy it as much as I did and if you haven’t yet checked out my group, it’s a lovely supportive place to get additional food ideas, motivation and recipes for your Slimming World journey. We would love to see you there. For the coconut milk – I use canned light. I don’t recommend using the stuff that you get in the cartons, as it’s not quite as creamy, that stuff is generally more for drinking/pouring etc. Of course, if you are okay with it not super creamy, then go ahead if you want to save a few additional syns. This is not too bad though with the canned light coconut milk, once divided into servings. I used brown rice which takes a little while longer to cook than regular rice, hence the longer simmering time for this soup, but you can use long grain rice if you want, I wouldn’t simmer for any longer than 15-20 mins max. 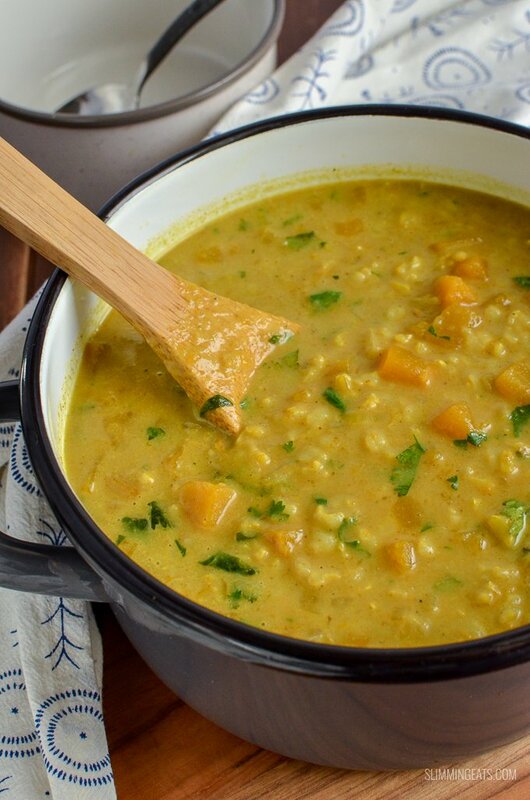 WHAT KITCHEN ITEMS DO I NEED TO MAKE THIS CURRIED BUTTERNUT SQUASH AND BROWN RICE SOUP? Add the garlic and fry for a further minute to infuse the flavour. Add the butternut squash, curry powder and a little of the stock (just to prevent sticking) and mix to combine. Rinse the rice under cold water, and add into the pot along with the rest of the stock. Bring to a boil and then cover, reduce heat and simmer for 40mins. 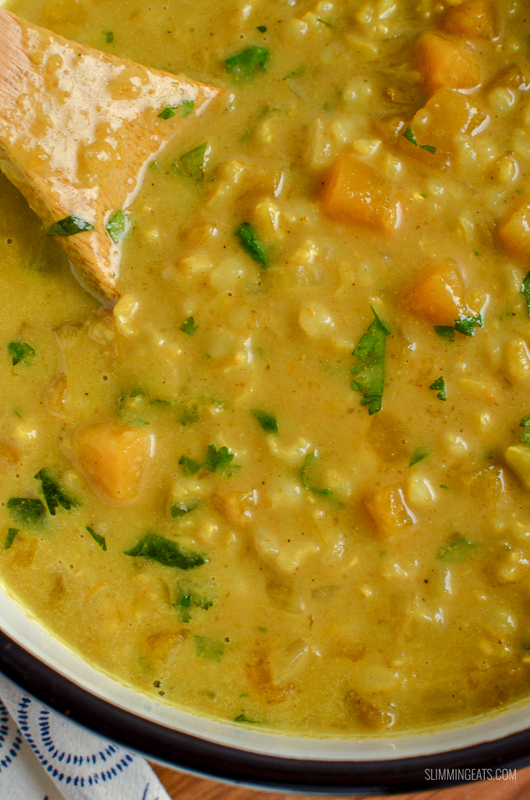 Stir in coconut milk and cilantro, and continue to simmer until heated through and creamy. Set to saute mode, and spray with cooking oil spray. Once hot, add the onion and fry until softened. Add the garlic and fry for a further minute to infuse flavour. Add the butternut squash, curry powder and a little of the stock (to prevent sticking) and stir to coat. Rinse rice under cold running water. 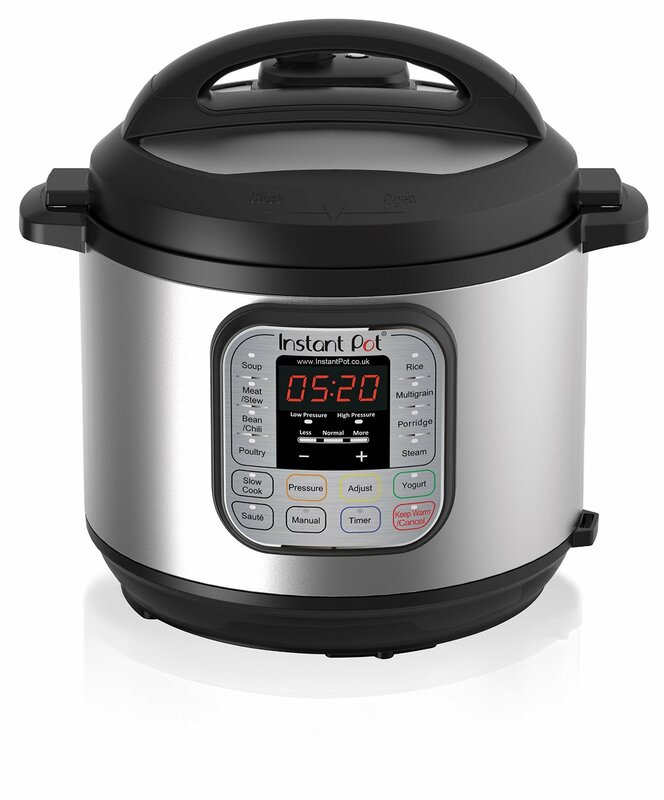 Add to the instant pot along with the remaining stock. Add lid, ensure valve is closed and cook at high pressure manual setting for 20 minutes. Let pressure naturally release for 10 minutes, then quick release any remaining pressure. Set to saute mode again, add in the coconut milk and cilantro (coriander) and stir until heated. Hi, can this be reheated safely? Yes, this is fine to reheat. Just ensure you refrigerate any leftovers as soon as possible, and reheat till full heated through. Hi Elaine, yes I have frozen this soup, you may need to add a little stock when reheating as it will absorb more of the liquid and of course always with rice, make sure it’s fully heated through and frozen/refrigerated correctly once cooked. Excellent recipe! Rice in the soup is delicious. I subbed the 1/2c brown rice with 1/3 c brown rice and 1/4c lentils to add some protein and added chopped kale with the cilantro at the end… DELICIOUS and filling!!! My husband made this for dinner tonight, and it was fantastic! It’s always nice to find whole food plant based recipes that taste this good. My only regret is that he didn’t double the recipe. Will definitely be making this again. My new favorite recipe! 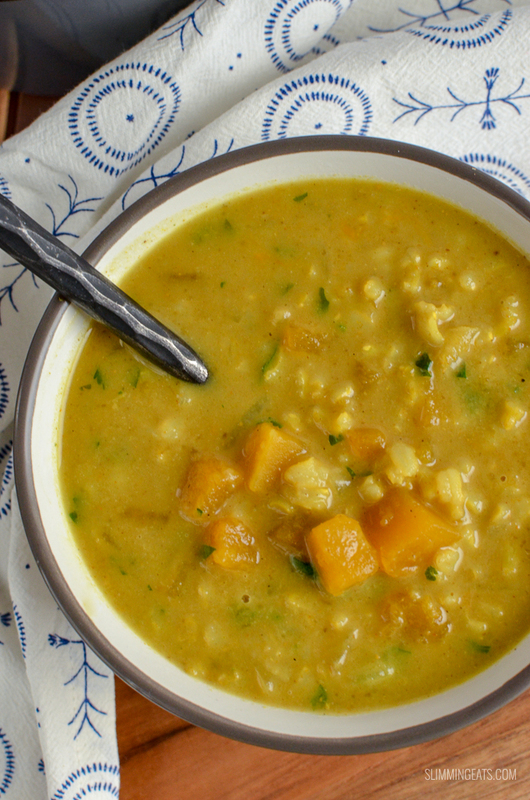 Can you use Sweet potato instead of Butternut squash? Have a hard time getting into the squash due to illness. Unless there’s an easy way of prepping squash that I don’t know about? yes you can use sweet potato. To cube butternut squash, I cut off the nose part first and use a sharp knife to slice off the skin and then cube. You can then do the same with the bulb part, removing the seeds and cutting it into pieces that are easier to manage.